When you are cooking for two the name of the game is "waste not". Even though Sam often eats for three, we still have an extra one or two ingredients left over. The trick is to use up as much as possible throughout the week, especially when you're working with a mini-fridge, which tends to speed up the spoiling process. One of the best things to cook in the summer is pasta with a fresh tomato, mozzarella, and basil sauce, which easily uses up my left-over ingredients. Side Note: It's very important when cooking with a limited pantry that you at least buy the best ingredients you can find. For that reason, I always have a good block of parmesan cheese, sea salt, and good olive oil in my kitchen. They can make all the difference in a simple dish. Salt and add oil to water. Add pasta when boiling and cook according to package directions. 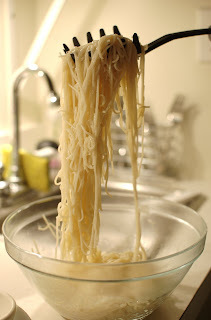 Drain and run cold water over the pasta to stop it from cooking. Transfer to bowl. Add the oil and mix into pasta. 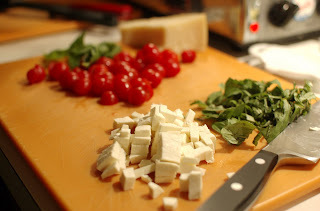 Add the tomatoes and basil, saving the mozzarella until the end so it does not melt in the bowl. Add parmesan, salt & pepper to taste, and mix thoroughly. 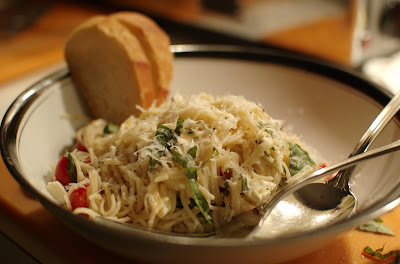 Serve with more parmesan and freshly ground pepper.